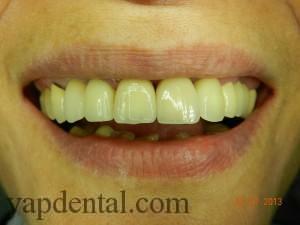 Dental Implants are now safe, predictable, have good clinical results and offer excellent esthetics. It is the treatment of choice to replace missing teeth. Talk to us about implants! We will help you smile confidently! Dental implants should ideally be inserted as early as possible after extraction is done, before any bone resorption occurs. 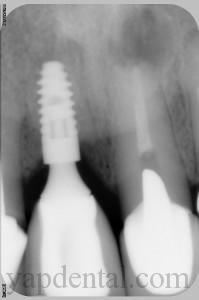 The ideal sized implant should be placed within 3 Months after extraction. If there are no signs of infection in an extraction socket an immediate implant can be placed on extraction day, provided that primary stability of the implant can be achieved. In severely resorbed areas of the jaw, bone grafting procedures may be necessary to ensure complete coverage of the entire implant in sound bone. It is a good idea to plan ahead for implant treatment before you extract the hopeless tooth, as timing of implant placement decides the overall appearance of the final crown. It is important for us to maintain the gum level of an implant at the right height in the anterior part of the maxilla and mandible to create a natural smile! In fully toothless patients a number of implants are needed to support a series of implant bridges or to support an overdenture. It is now possible to restore toothless areas in the mouth like never before. Dentures will become obsolete one day! 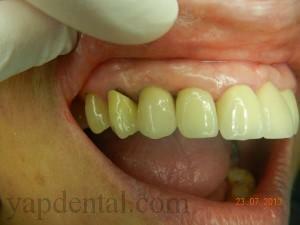 In these photos, the patient had single implant crowns on her upper right canine and upper left central incisor.. They blend in beautifully with her natural dentition. This result is a routine outcome in most of our patients. For more information and pictures regarding 'Implants', please visit our photo gallery at your own leisure. ONE GUIDE KIT Now available as an option at our clinic: Our clinic is one of the first to embrace the Osstem One Guide System to catapult implant dentistry into the next level. Implant surgery is now safer, more accurate and faster, with the introduction of Osstem One Guide Kit into our surgical protocol. Implants are now planned digitally. With outcome predicted before the surgery begins, and flapless to reduce pain and discomfort.